Tired, overworked, coffee your best friend? Adrenal Fatigue goes by many names. Although it is not recognized by main stream medicine as a medical condition, it has reached epidemic proportions in today’s society. Your adrenal glands sit on top of your kidneys. Their function is to enable your body to deal with stress. Normally functioning adrenal glands secrete specific hormones in very precise and balanced amounts. They are extremely responsive to changes in your physical, physiological and emotional environment and therefore, many factors can interfere with their balance. Too much physical, emotional, environmental and/or physiological stress can cause your adrenal glands to pump out too much hormone that they are left depleted and unable to handle further stressors. The extreme of this is Addison’s disease which is life threatening if untreated. Fortunately, the extreme case only affects about 4 in 100,000 people. Adrenal fatigue however, is a milder version of Addison’s disease and is treatable. Once you take a look at the list of symptoms, you will realize that it affects a large proportion of the population. The modern lifestyle has a lot to do with this. Taking the time to reverse the damage now will lead to a much healthier and happier life. These are signals from your body that you need to get your adrenal glands back on track! Financial pressures, caffeine, poor nutrient intake, lack of sleep, relationship stress, sugar intake, allergies, lack of exercise, smoking, negative attitudes, infection, fear, prescription drugs, death of a loved one, environmental toxins – to name just a few. In order to diagnose adrenal fatigue your Naturopathic Doctor may ask you a series of questions, perform a physical exam and conduct a urine test. Be careful of self-diagnosing. Symptoms of adrenal fatigue can be similar to other serious conditions that may need to be addressed immediately. Depending on your situation, I will use an appropriate combination of several therapies to get you back on track. Lifestyle changes are the roots of addressing adrenal fatigue but therapies such as nutritional supplementation, botanical medicine, hydrotherapy and traditional Chinese Medicine help to speed up the process. Remember, it took you years to get to this point. Your body needs to adjust to recovering as well. The earlier you start, the sooner you will be feeling energetic again! Carbohydrates should make up 60% of your daily diet. Carbs are one the main sources of nutrients for your body, but what is it for, and what foods are good carbs vs. Bad carbs? Your digestive system converts carbohydrates into glucose (or blood sugar). You body uses this glucose for energy for your cells, tissues and organs. So getting the correct type of carbohydrates into our diet is vitally important for daily energy and body function and to prevent obesity and other diseases. 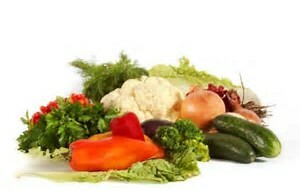 Want more information about eating a balanced and healthy diet? Want more energy to get through your busy week? Come see Jaclyn Clarkson R.H.N, our resident Holistic Nutritionist! Ask about a free 15 minute discovery session at the front desk to find out if Holistic Nutrition can help you with your health concerns. How to Holistically Heal your Headaches. Is the first thing you do, when you have a headache, to reach for the Aspirin, Tylenol, Advil, etc? Did you know that while your symptoms may be abated quickly, the reason you must keep taking it every 2-4 hours is because these “remedies” are simply masking your pain, not alleviating it. While popping a pill seems like the easiest solution, consider the long term damage it may do to your liver, which must process these pharmaceuticals. You are also ignoring the root cause of why you are getting these headaches to begin with. Wouldn’t you much rather eliminate your headaches for good, than experience the daily/weekly/ monthly pain of a headache or migraine? Tension Headaches: Instead of popping that next Tylenol, try a handful or two of almonds! While some people may actually have almonds as a headache trigger food, most people will find some relief due to something called salicin which is found in over the counter medication as well, but when consumed naturally causes no harm to the digestive organs. Migraine Headaches: Try some Feverfew! The theory that your blood vessels during a migraine are expanding in the brain putting extra pressure on nerves, which in turn is exhibited as a migraine headache. Feverfew has the proven ability to relax and thereby constrict blood vessels easing some of the pain. It is also helpful in reducing overall inflammation and pain which is similar to taking an aspirin once a day, but with no side effects. Tension/Stress Headaches: Exercise! Yes, this may seem like the last thing you want to do when you come down with a pounding headache, but actually, a little yoga, fresh air, and regular movement can stretch, release, and calm aching muscles, relax the mind, and physiologically release endorphins which make you happy and calm. Keeping your exercise regular, social, and including outdoor activities or activities that you love will help you kick your tension and your headaches to lead a healthier overall lifestyle! More nutritional remedies and my personal favourite, includes ginger! With many benefits, ginger root is thought to not only aid in nausea caused by your migraines but inhibit the prostaglandin synthesis which makes fat compounds within cells that act like little chemical messengers mediating biological processes such as inflammation, pain, etc. So next time you get a migraine or headache, try steeping a few slices of ginger root in boiling water, sip and relax as your pain melts away! Another favourite of mine, which is particularly useful for people with anxiety, high stress jobs, and in particular for students, is peppermint oil. Put a few drops behind your ears to clear your mind, relax, and breathe easier. And last but most importantly, DRINK PLENTY OF WATER! Hydrate, hydrate, hydrate. Where is your headache coming from? Tension headaches, previously called muscle contraction headaches, are the most common type. The pain is often mild to moderate and can feel as if constant pressure is being applied. While most adults get tension headaches periodically, some are chronic sufferers, meaning they experience one daily. Its name alone indicates the role of stress (mental, physical or emotional) that triggers the pain and contracting muscles in the neck, face, scalp and jaw. They are often brought on by jaw clenching, intense work, missed meals, anxiety, fatigue, and especially poor posture. You could take a couple of ibuprofen tablets to help relieve the pain, however, there’s a price to pay. Frequent use of ibuprofen can lead to damage of the stomach lining, constipation, hypertension, and kidney disease. So why not try to address the direct cause of the symptoms? While it may be brought on by a certain stressor in your life, the pain is actually caused by a trigger point. 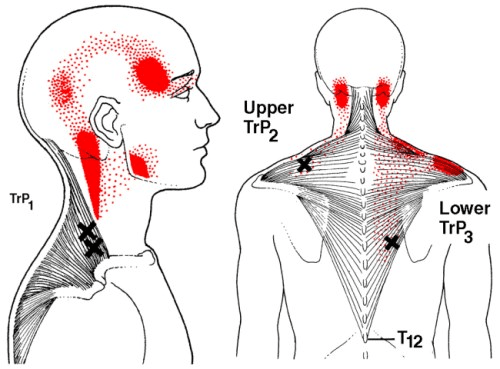 Trigger points are an extremely common cause of pain. They are painful when pressed on, lead to increased muscle stiffness, decreased range of motion and restricted blood flow. These points also have a special property called referred pain, which means the trigger point in one muscle can also refer pain in another area. One may develop due to an acute muscular strain (such as a car accident, fall, or excessive exercise), or chronic overload of a muscle (poor posture, or repetitive work tasks). Continual strain on the muscles cause small tears which the body tries to prevent by forcing the muscles to knot up in a sustained contraction. These knots formed by the muscle contracting may cause scar tissue to form or trap pain receptors within the fibers, and cause nutritional deficiencies due to loss of blood flow. Studies have shown that in regards to tension headaches, massage can help reduce the perceived pain, intensity, frequency, duration and decrease medication use. Massage relieves the muscle spasms and tension by loosening tight muscles and constricted bands of tissue, while stimulating circulation. By decreasing the hyper irritable tissues, therapy can help manage the pain referrals, amount of knots and scar tissue in the muscle. Regular treatment can also help increase the feel-good endorphins while decreasing levels of the stress hormone cortisol to help restore the body to a balanced hormonal state resulting in improved sleep and fewer headaches. 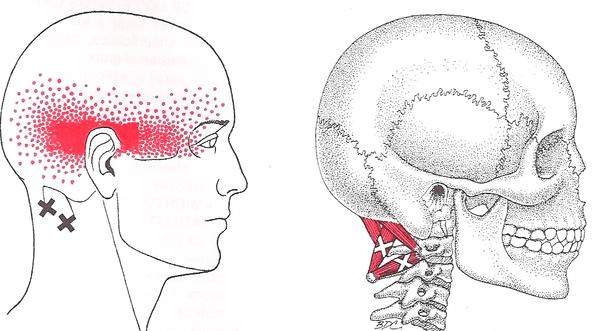 The common muscles that cause headaches due to their trigger point referral patterns are often the upper trapezius, subocciptals, and sternocleidomastoid. The upper trapezius forms a question mark up your neck and around your eye, while the suboccpitals are responsible for creating the feeling of wearing a tight headband. The sternocleidomastoid may create the symptoms of pain behind or above your eyes, as well as jaw pain. Book an appointment with your massage therapist to help treat these trigger points and learn some stretches that will help prevent these headaches from coming back! The Massage Clinic Health Centres, Where are your headaches coming from?